When we sat and planned our route north to the alps we decided that we would have one final day by the beach – after all the next time we would see the coast would be when we were preparing for our crossing to the UK, and Britain’s spell of lovely weather would surely have petered out by then. We hadn’t planned a Lido experience, but then things rarely turn out exactly as planned. On our way south we had bypassed the Cinque Terre due to bad weather, but the area would make a convenient half way point on our journey north. We looked at parking options, which were limited, and then we looked at ACSI campsites, of which there are a good number. I emailed a couple of ACSI campsites to be told they were fully booked, I suppose it was the weekend and the weather was in the high 20’s, we weren’t going to be the only people heading for sea and coast. One of the campsites told us to just turn up, they keep spaces aside for people who drop in, so we put the coordinates into the sat nav. But as we drove northwards and slowly braised in our own juices in Bertie’s greenhouse-like cab, we decided that the thought of arriving somewhere only to find it was full would probably cause a literal as well as a metaphorical melt-down. 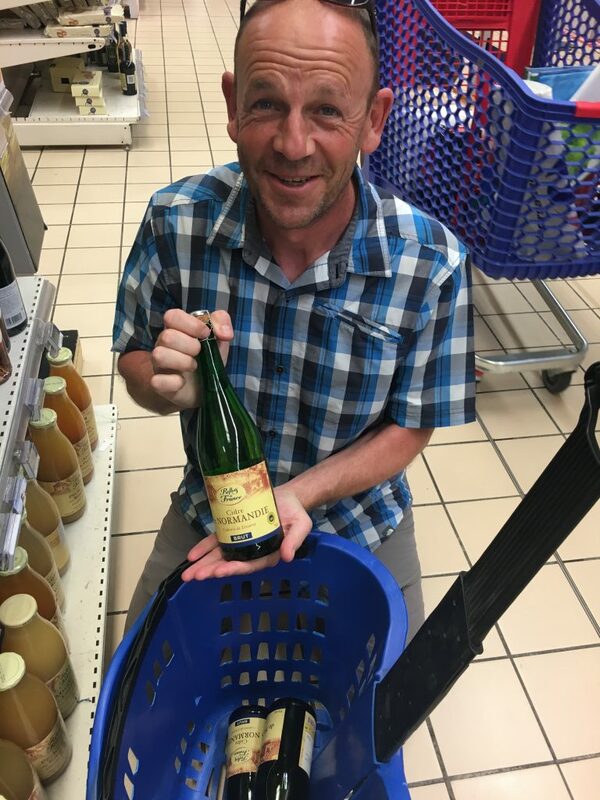 A sure sign we were heading north – Paul finds his first cider for three months in a Carrefour supermarket. And takes their entire stock! A quick look at Camper contact and Park4Night revealed a large, free, sosta at Celle Ligure. It was north of the Cinque Terre, so yet again we would not manage to see this renowned area of Italy, but we were much more likely to turn up and find a spot. We re-set the sat nav and carried on along the autostrada (it was too hot for navigating smaller roads), enjoying the views as we trundled through tunnels and out onto bridges across deep valleys that led to the sea. Celle Ligure was in one of these valleys and taking advice from one of the reviews we ensured that we turned right immediately after exiting the toll station. Within minutes we were at the sosta, reversing into a parking space alongside half a dozen other vans. The Celle Ligure sosta. All the flat spaces were quickly taken. 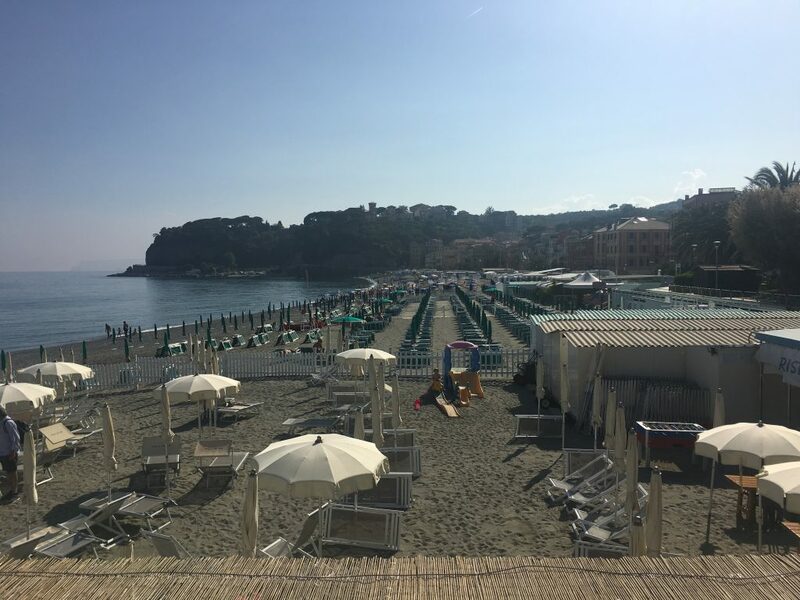 Italy surprises us sometimes – we’ve had plenty of free beachside parking spots, but most have been in car parks, or places tolerated in the low season, rather than official sostas. Here we were in an official sosta, with about 30 parking spaces and services (no electric), where the maximum stay was 14 nights. You could spend your summer vacation here without spending anything on accommodation. We thought there must be a catch, maybe the resort was a bit down at heel, trying to gather more visitors by offering this freebie. We popped down into the town, and wandered along the seafront. It was a pleasant tourist resort with a small number of hotels, cafes and restaurants, the evening passeggiata was in full swing and plenty of gelato was being consumed. The downside? 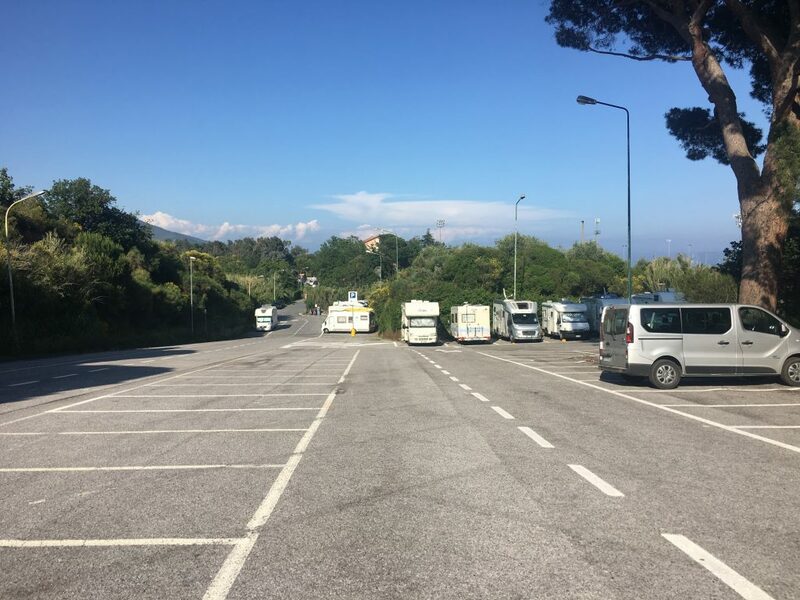 As far as we could tell the only negative points were – lots of the motorhome spaces were on a slope, it was a pretty hilly walk back from the beach and a large proportion of the beach is lido territory. The Italian Lido is a bit of an alien concept to us Brits. We’re used to going to the beach, finding our spot and settling in. We may have paid an exorbitant fee to park our vehicle, but we don’t expect to pay for the privilege of being on the beach – we think of it as one of the last things that belongs to us, the humble public (but don’t you believe it, our right to access the sea is a messy legal question). Here in Italy access to beaches can be tricky. We had found it on the Gargano Peninsula where we couldn’t even get a glimpse of the sea due to private land blocking off access – were we going to be in the same situation here? Actually Celle Ligure beach has two Spiaggia Libera – free beaches – and if you google (always a source of unadulterated truth of course), you could even take your towels and legally lie between the sun loungers of a lido, so long as you don’t use their services (does that include the shade provided by their umbrellas?). The Lido is there to provide not just access to the beach, but a whole host of services, sun loungers, umbrellas, changing cubicles (none of that under the towel shuffle), toilets, showers, food, music, wifi. Think of it like being at an holiday resort but just for the day. And so Paul persuaded me that if we were going to have a day on the beach, and if the weather was nearly 30 Celsius, and given that we hadn’t paid for a campsite….you can see where this is going, straight to our first Lido experience. We went to the Direzione where we paid a small fortune for our beach equipment and were then escorted to an umbrella of our choosing (so long as we didn’t want one that had already been reserved). We lazed in the sun, read books, researched our trip to the alps, went for a swim (or five), snorkelled, ate panini and gelato and managed about 5 hours on the beach before it became a bit much. We kept in the shade of the umbrella as much as possible, following it around as the sun moved across the sky, and like the ticking hands of a clock everyone in the Lido moved in the same direction. It was interesting, but it reminded me of my one and only all inclusive holiday, fun for a short while but after 24 hours…talk about going stir crazy. Paul’s key justification for spending the money was the need for shade – so he’s getting a beach umbrella for his Birthday.